You will get that exercise that you're always complaining is so hard to get during the long winter. Begin by stretching your muscles inside. Once you begin to remove snow, use your legs and maintain a good posture to keep from putting undue strain on your back. Drink water to keep your body hydrated. Continuous snow shoveling can put you at risk for injury if you are not in tip-top shape; it is good policy for snow shoveling safety to promise yourself beforehand that you will take a break every 5 minutes or so (wear a watch). This also gives you a chance to drink water so as to stay hydrated. First and foremost, should you be shoveling at all? Do you have a history of heart attack or stroke issues? Consult with your doctor. 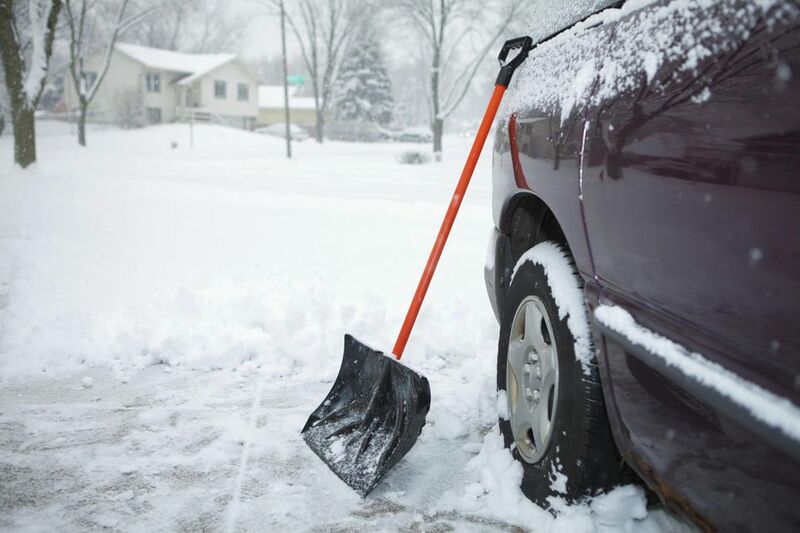 Be very careful shoveling snow where your driveway intersects the street. Oncoming cars can skid out of control in icy conditions; if you are not paying attention to traffic, they could skid right into you. Another risk in icy conditions is that you will lose your footing while snow shoveling. Depending on your physical condition, a slip could easily cause you to pull a muscle or, worse, fracture a bone. Make sure you wear slip-resistant footwear. More heat escapes through your head than through any other part of your body. That is why it is so essential to wear a warm winter hat when it is really cold outside. But for comfort, it is just as important to keep your hands and feet dry and warm. Nothing makes you feel more miserable when shoveling than having wet feet, so invest in a pair of winter boots. Many people say their hands stay warmer wearing mittens than wearing gloves, because, when your fingers are huddled all together, heat loss is reduced. Many others, though, point out that they can grip the handle of a snow shovel more comfortably wearing gloves, due to increased dexterity. If you really dislike the way mittens feel, a good pair of gloves should be able to keep your hands warm on all but the coldest of days. Efficiency takes a number of forms when shoveling snow. The first trick is put into action while you're still in the house: Spray cooking oil on the blade of your shovel so that, when you remove snow from the driveway and attempt to fling it into a pile (on the lawn, for example), the snow will not stick to the blade. As an alternative to cooking oil, you can wax the blade with candle stumps. Don't walk or drive all over the snow before you start shoveling it. This will pack it down and make shoveling harder. Do not remove snow (in a thorough manner, at least) where the driveway intersects the street until last, since plows may well push more snow into your driveway while you're in the process of shoveling. It is frustrating to think that you are all done and don't need to remove snow again until the next storm, only to see the plow come by five minutes later and dump a wall of snow in front of your driveway. When you remove snow from the driveway and toss it somewhere, make sure you're not tossing it some place where it will be in the way. For example, do not block access to your outdoor storage shed with snow piles. Speaking of clearing winter's precipitation off your driveway, an unexpected problem you may encounter in late winter with solid-surface (such as asphalt) drives is puddling. As all of that snow melts, there is nowhere for the water to go (unless your driveway is situated on a slope). Worse yet, if freezing temperatures return, the puddle turns into a dangerous sheet of ice. This would rarely be a deal-breaker, in and of itself, when it comes to choosing a driveway material. But if you are torn between having a solid surface versus a permeable material (such as gravel), it could be the deciding factor that tips the scales in favor of the latter.